Carl Stone is one of the pioneers of live computer music, and has been hailed by the Village Voice as “the king of sampling” and “one of the best composers living in (the USA) today.” Since 1986 he has used computers in live performance to make gorgeous sonic tapestries out of fragments of recorded music and the sounds of everyday life. The sources may be familiar – Schubert, Hendrix, Miles – but they are woven together to create something completely new and surprising, revealing other musical worlds hidden deep within the familiar. That sense of whimsy and playfulness extends even to the titles of Stone’s compositions, which are all named after his favorite Asian restaurants, or dishes on their menus. Carl Stone was born in Los Angeles and now divides his time between San Francisco and Japan. He studied composition at the California Institute of the Arts with Morton Subotnick and James Tenney and has composed electro-acoustic music almost exclusively since 1972. His works have been performed in the U.S., Canada, Europe, Asia, Australia, South America and the Near East. In addition to his schedule of performance, composition and touring, he is on the faculty of the Media Department at Chukyo University in Japan. Recordings of Stone’s music have been released on New Albion, CBS Sony, Toshiba-EMI, EAM Discs, Wizard Records, Trigram, t:me recordings, New Tone, and various other labels. A winner of numerous awards for his compositions, including the Freeman Award for the work Hop Ken, Carl Stone is also the recipient of grants from the National Endowment for the Arts, the Rockefeller Foundation and the Foundation for Performance Arts. In 1984 he was commissioned to compose a new work premiered as part of the Olympic Arts Festival in Los Angeles. 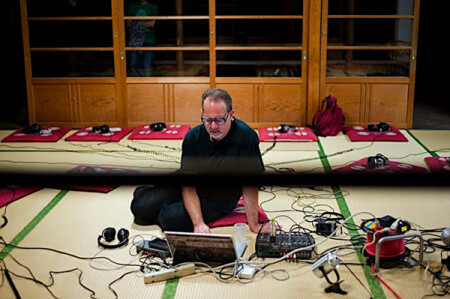 He has used computers in live performance since 1986. He studied composition at the California Institute of the Arts with Morton Subotnick and James Tenney and has composed electro-acoustic music almost exclusively since 1972. His works have been performed in the U.S., Canada, Europe, Asia, Australia, South America and the Near East. In addition to his schedule of performance, composition and touring, he is on the faculty of the Media Department at Chukyo University in Japan. Carl Stone’s music has been used by numerous theater directors and choreographers including Hiroshi Koike, Akira Kasai, Bill T. Jones, Setsuko Yamada, Ping Chong, June Watanabe, Kuniko Kisanuki, Rudy Perez, Hae Kyung Lee, and Blondell Cummings. Musical collaborations include those with Yuji Takahashi, Kazue Sawai, Aki Takahashi, Sarah Cahill, Haco, Dorit Cypis, Michiko Akao, Stelarc, z’ev, Bruce and Norman Yonemoto, Tosha Meisho, Otomo Yoshihide, Kathleen Rogers, Min Xiao-Fen and Mineko Grimmer. Carl Stone served as President of the American Music Center from 1992-95. He was the Director of Meet the Composer/California from 1981-1997, and Music Director of KPFK-fm in Los Angeles from 1978-1981. He often hosts a weekly program on KPFA-fm in the Bay Area.